Music Matter was established in 2009 by a group of engineers, DJs and music production specialists with over 25 years of experience. It's one of the UK’s largest online music retailers of music production, home recording and professional studio equipment, selling a variety of products, from headphones and microphones to keyboards and audio interfaces. 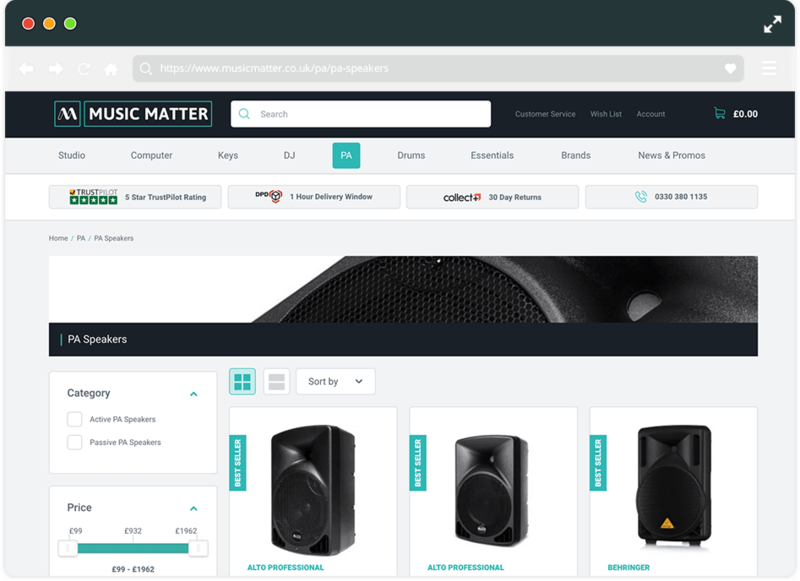 Music Matter were looking for a Magento partner who could help them to create a site which was easy to use on mobile as they had seen a large increase through this device. They were also looking for help to restructure information and categories and to improve not just user experience but also user confidence when using the site. We worked with Music Matter to build responsive templates which embraced the new style of the brand and provided a more professional look and feel to the site. Allowing internal development teams to use the templates with ease due to the installation of Magento. Pages were designed to work beautifully with the variety of content that Music Matter has, being industry leaders the site is used by both professionals and users who create music as a hobby so the news section is an important feature of the site, as well as the products themselves. We audited the content and created a new structure which organised this in a way which is easy for users to navigate and understand. While the site has only recently gone live, there has already been an uplift in the conversion rate, revenue and quantities being purchased, suggesting products are easier to find and that user confidence has been improved.